The picture below has both the cantle plate (flat concho) & the horn cap (slight dome). 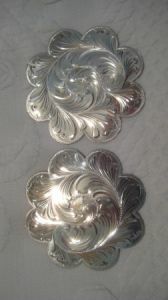 Both are made of sterling overlay and are hand engraved with a beautiful design. Select the type of concho you wish using the drop menu. If you need a different design or size, please contact us.